Furnace or Heat Pump – What Will Work Best for Your Home? When looking at home heating systems, you are going to have to choose between a heat pump and a furnace. So, what is the better option? Furnaces burn fuel, so their performance is measured with an AFUE rating – the higher the rating, the more efficient the furnace is. 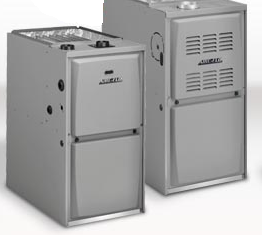 For a gas furnace, it has to have a rating of at least 90% to be considered of a high efficiency. Heat pumps run on electricity, so their efficiency and performance are measured with a SEER rating. A good quality heat pump has a 14 or 16 SEER rating. Essentially, a heat pump is an air conditioner that can also work in reverse, so it can cool your home in summer and warm it up in winter, giving you both solutions in a single system. It can either pump the heat into or out of your home. They are considered environmentally friendly because they do not require fossil fuels, but they can be more expensive to run because of the higher price of electricity despite often being more efficient than a furnace. They are also a bit heavier on maintenance, but that is because you use them all year round, so they work twice as hard as your air conditioner and furnace. Heat pumps are only efficient in weather that is above freezing temperatures, as they work by pumping heat from the environment into your home. If you regularly experience below-freezing temperatures in winter, this option will not work for your home unless you have supplemental heating systems like a wood-burning stove. A furnace, on the other hand, can operate in even the coldest environments as long as it has fuel. Therefore, your energy bill will increase, as it gets colder and the furnace has to work harder. The lifespan of a heat pump is around 15 years, while a furnace can regularly last over 20 years (although you can expect to see a decrease in efficiency as it ages). Fuel expenses for a furnace will change according to the type of fuel it uses, and while a gas furnace is often more affordable to run than a heat pump, many people don’t have access to natural gas in their area. At Crosstown Plumbing Supply, we can assist you with choosing a high-efficiency, low maintenance replacement for your furnace, heat pump, water heater or boiler and we can provide you with an extensive range of plumbing supplies to replace the necessary parts in your current system. As we are a wholesaler in a 3.5% sales tax zone, we can make your repairs and services the most affordable in town. Our sales consultants are highly experienced and happy to assist you with finding the right part for your needs. We work closely with reliable, affordable plumbing professionals whom we are happy to recommend to our clients for furnace repair. For more information about our specials on replacement boilers or to find out more about the boilers we can offer you, please visit our plumbing supply company website at http://crosstownplumbing.com/ today.